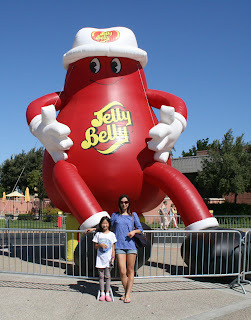 Heather's Perfect Posts: My Trip to the Jelly Belly Factory! Now we were at the Jelly Belly factory and there are some jellybeans that I have to introduce to you. Some taste really different but look the same. Those are the bad ones. Some are Juicy Pear and Booger and Buttered Popcorn, Moldy Cheese, and even Licorice and Skunk Spray! The worst one that I think is really disgusting is CENTIPEDE! The flavor that taste like Centipede is Strawberry Jam. There were also some recipes and the recipe will tell you the name and show you how it looks like and you will find them and put them in your mouth and taste them! I think the recipe idea is real neat. Don't you? Here are pictures made out of little tiny jellybeans! 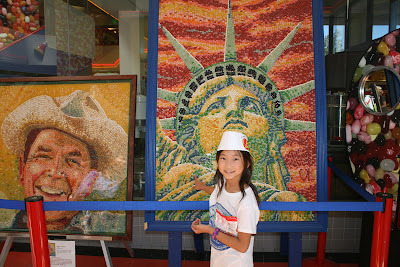 Who knew that you could make art out of jellybeans? The one to the left is Ronald Reagan, one of the jellybean lovers! First, we saw lots of bags of sugar and corn corn starch. It also included corn syrup. There are other ingredients, but those are the main ones. Second, our tour guide showed us some movies like how to make a jellybean and all of the machines that you use to make jellybeans sugar! Some are called belly flops because they are not in the right shape. Then our tour guide gave us free samples for each step of a jellybean, like when it was not polished. It was very bumpy. That's because it is covered with sugar. It tasted the same though. Next, we watched some videos about polishing the jellybean and our tour guide gave us a polished jellybean that was all finished. Finally, our tour guide gave each person a bag of jellybeans and that was the end of our tour. Clearly, making a jellybean does take time! After our tour, we went to the shop. I brought a sour pack of jellybeans and my brother brought a mini pack of jellybeans. His had some disgusting ones. Before we checked out, we went to eat some samples. There is a kiwi one that they said is really hard to make, but taste exactly like kiwi. I got some samples of that. I also got samples of tutti-frutti and a bubble gum. It was not long after we came. There were menus and there were actually menus of different languages! Some of the languages were English, Chinese, Arabic, Dutch, Spanish, and more. Inside the menus were information about jellybeans. The information was mostly about how they look like and what are the names. There is also recipes and in each menu. Some are different kinds and some are the same. We left the Jelly Belly Factory and now we were going to leave to Napa Valley now! Have you ever visited the Jelly Belly Factory? If so, did you go on a tour when they were actually making jelly beans? If you haven't, have you ever heard of the Jelly Belly Factory? What a delicious post all about California's Jelly Belly candies! I must confess, they are one of my favorite candies. In fact, Mr. Yollis just bought me a big jar of them from CostCo! I have to really pace myself so I don't eat too many at one time! I thought you did a fabulous job of outlining the tour. Your use of transitions really helped the flow of your writing. Well done, Heather! Your second grade teacher must be so proud! My favorite flavors are cherry, cotton candy, and licorice! I used to try and pick them out from the big bucket, but I found it takes too long. How long does it take for them to produce a bag of Jelly Belly candies? Did they say which flavor is their most popular? Also, how much does it cost for a small bag of Jelly Belly candies? Jellybeans are not my favorite candy, but they do taste really good. I don't have a favorite candy because once I like one type of candy, later on I like another type of candy. I do not know how to decide. They said that the most popular flavor was the flavor called Very Cherry. To me, Very Cherry is not my favorite. My favorite flavors are tutti-frutti, bubble gum, and kiwi. Have you ever tried the flavor kiwi? My mom once bought a jar of Jelly Belly jellybeans. I didn't try to find my favorite kinds because there were lots of flavors I like. It takes one week to produce a batch of jellybeans. I don't know how many bags that is. The smallest box of jellybeans cost one dollar. As I mentioned before, I bought a sour pack of jellybeans. That sour pack cost about two and a half dollars. Have you ever been to the Jelly Belly Factory? It's always great to read a sweet summer blog post. Heather, you are a great writer. If I hadn't seen your image in the post, I would've thought you were much older. By the way, I love how you gave credit to your family for the images you posted. I have been to the factory when they are making jelly beans. The workers look like busy ants when you are viewing them from the upper walkway. The place is much louder and the machines make interesting noises that could almost be the beat to a rock song. Don't you think it's amazing that they thought of polishing the jelly beans to make them shiny? Before I went on the tour I had never heard of polishing candy. I'd heard of polishing shoes, polishing rocks, polishing apples - but never candy. My favorite part of the tour, besides the samples, is the machine that puts the Jelly Belly logo on every single bean. Whoever invented that machine is an amazing engineer. I did not know there was such a place! Hoe interesting! I learned so much from your blog. Never knew they polished the jelly beans to get them smooth. What do they do with the belly flops? Sounds like you had a wonderful time. I agree with Mrs. Yollis above that you did some great writing and your transitions were some and we'll thought out. At the visit, I learned that they actually sell the belly flops. They are not so pretty, but they taste as good. The try their best to not make belly flops, but even if they do, they could still make money selling them. Have you ever tasted a belly flop? Since you are in South Carolina, I am wondering if you have the supermarket called CostCo. They basically have every food you will need, along with some other snacks. My parents and I always go there shopping, buying different foods and vegetables. My teacher, Mrs. Yollis, is right about the Jelly Belly jelly beans that they sell at CostCo. If you don't have the supermarket CostCo, where do you shop at?